There's no one wrong way to fry a turkey. Nope, there's at least seventeen of them, as we got video proof of today. 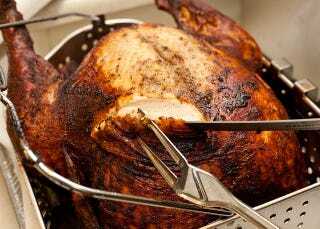 Fortunately, we also got a few tips on how to fry your turkey the right way. Step one: KILL the flame as you drop in the turkey, i CANNOT stress this enough. Step two: ALWAYS use water to measure EXACTLY how much oil you need to put in the pot. If you're anywhere near 3 inches or less from the top, use a bigger pot! Step three: make sure the turkey is properly thawed and dry. water and oil do NOT mix. Especially hot oil. Step four: NO. Your water hose isn't what you need to extinguish a fire if you end up with one unless you plan to burn down your neighborhood. Step five: SLOWLY dip in your turkey. throwing anything in hot oil is a recipe for disaster. Step six: MEASURE MEASURE MEASURE the temprature of your hot oil. Never above 350, never below 250-280. Look at hot oil the wrong way and it'll catch on fire. If you noticed, the steps are definitely NOT in order. Start with the drippings (discarding all but about 2 tablespoons of the fat) in the pan and over medium-low heat whisk in about the same amount of flour until smooth. Cook this mixture until it gets golden-brown and starts to smell nice and toasty. Then add a splash of white wine if you like, followed by your broth or water, whisking constantly. Simmer for a few minutes, whisking frequently, and add more liquid to thin the gravy once it thickens up. Don't forget to season to taste! Whatever you end up doing, fried turkey, roasted turkey (with gravy), or no turkey at all, fill us in on how it turned out in the comments.